UFC’s Black Coffee is produced with quality Robusta coffee beans, pleasant and balanced in flavour and fragrance. Our black coffee has strong and authentic coffee flavours with a hint of sweetness and aroma and freshly roasted coffee. 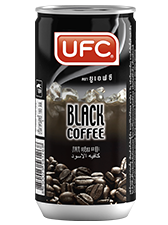 UFC’s Black Coffee is an ideal refreshment and energy boost for mornings and afternoons.